POST is pleased to host a one-person exhibition of works by New York artist Joe Amrhein. His work is a combination of different disciplines. Physically it comes out of painting, but the context is conceptual. 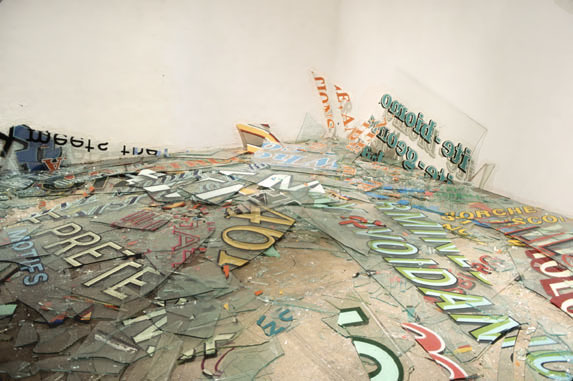 Using text and font icons as his primary subject, the source for most of the text in this work is appropriated from critical art writing. By sifting through these texts (primarily monthly periodicals like Artforum, Art in America, Flash Art, et cetera.) and pulling out the hyperbolae, key phrases that try to elaborate on the where, when and how aspect of the art it is describing. Caught in the parameters of language and writing, these key phrases sometimes seem ridiculous, especially when taken out of context. Often people assume he is making fun of the critics. Actually, he finds most of the selected hyperbolae almost poetic. One of the main reasons for using these texts is to bring them back into the art making processmaking art from critical prose by critical pros. The notion that this language replaces the art it describes, replacing an idea or something concrete with abstract language, is very interesting to Amrhein, but bringing this abstract notion of language back into a visual art is even more interesting. 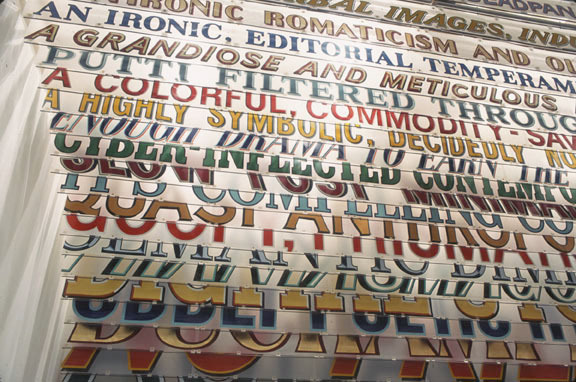 Quoting Robert Smithson, One must remember that writing on art replaces presence by absence by substituting the abstraction of language for the real thing. Some of the text he composes is not meant to be read but is used as almost an artifact, because it is so highly fragmented. 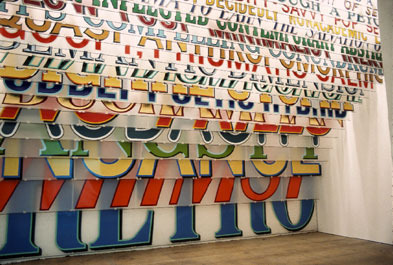 The use of sign painting to give this language scale and vitality comes out of Amrhein's experience as a sign painter. It also lets him use the issue of scale with impunity. He can develop it to any size because of the reality of signs and their multiple use. 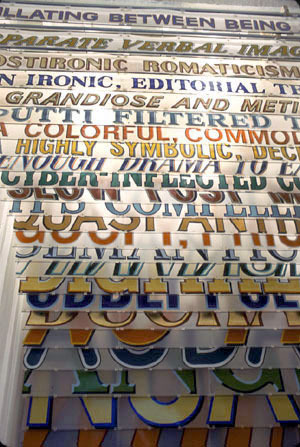 Most text work he sees, leaves him with the question of their use of scale, especially when it is large and developed from a single typeface. The materials he paints on, glass and vellum, besides being traditional surfaces for signs gives him the option to develop the text with a metaphorical contentnotions of density, fracturing, memory and shadows as ephemera, among others. Joe Amrhein is the owner and director of Pierogi gallery in New York. He will be organizing an exhibit of works on paper by artists from Pierogi flat files and flat files from POST.